Recently stumbled across this phone box, bedecked with tributes to Sherlock Holmes, outside St Bart's in Smithfield. In the last series of the BBC's Sherlock, our hero fell to his apparent death from the roof of the hospital. Although the final scene revealed that trickery was afoot, it hasn't stopped fans of the sleuth leaving personal messages at this latter-day Reichenbach. Calling the payphone may well get you a Sherlock Holmes fan on the line, or simply a tourist wondering what it's all about. 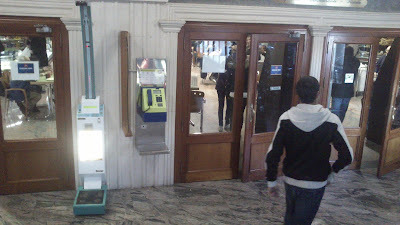 This payphone is from "Los Alcázares", a town near "Mar Menor" (Spain). clearly heard when passing nearby.